Research suggests that the development opportunities for children aged from birth to 5 years should reflect (a) the role of key adults, including parents; (b) young children's desire to communicate and explore the world and (c) the importance of the peer group. The young children's learning environment should be stimulating, exciting, safe and varied. At Little Monsters Day Nursery we ensure that these elements are consistently present in order to offer quality learning experiences to develop children's full potential. We feel it is important for the children to be able to experiment and try things for themselves in safe surroundings. Each day, our little monsters have the opportunity to take part in a 'focus activity' and have the opportunity to make choices and select activities. The children are at the centre of everything we do and observations form a core part of our daily practice. The outcome of observations inform all future learning opportunities by identifying the next steps to move their learning forward. Observations are made during both Adult Focus and Child Choice activities. We have very good links with local primary schools, especially The Mosley School in Anslow, John of Rolleston in Rolleston-on-Dove and All Saints Primary School in Rangemore. Every summer term, we invite the Reception teachers of all the schools our graduates will be attending in to nursery to see the children in the nursery environment. We discuss each child's progress towards the Early Learning Goals and anything that we believe will help their transition from nursery to school. This close communication ensures that we are preparing the children for school in a way that is best for them and the teaching staff who will be looking after them. 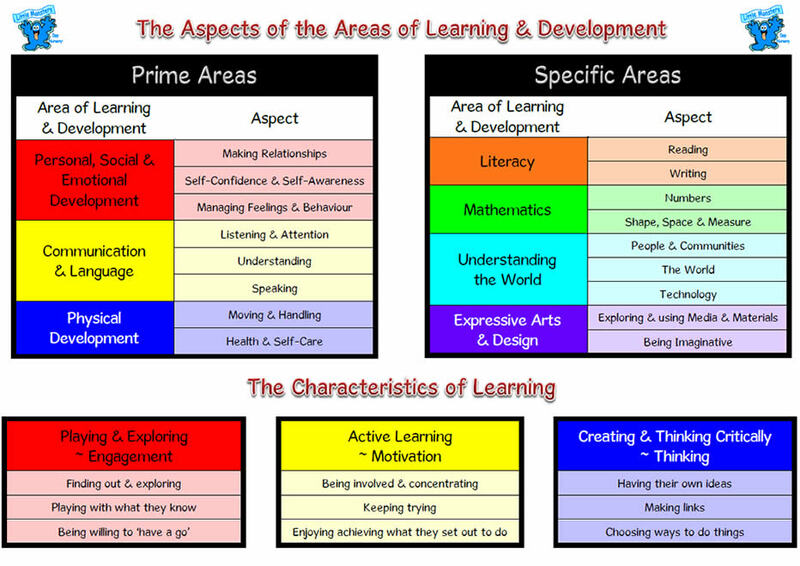 The children's learning is categorised into 6 areas of development. These are personal, social and emotional development, communication, language and literacy, problem solving, reasoning & numeracy, knowledge and understanding of the world, physical development and creative development. All of the activities for all of the children (whether child-choice or adult-led) encourage development in at least one of these areas. The Early Years Foundation Stage begins at birth and continues through the first (or Reception / Foundation) year at school. We support this by providing a well-planned and resourced curriculum to take their learning forward and to provide opportunities for all children to succeed in an atmosphere of care and of feeling valued. At Little Monsters the children are regularly observed and assessed in order to monitor their progression towards the 'Early Learning Goals' (developmental targets). The children are given lots of opportunities to choose activities / resources throughout the day. As children grow & develop, we actively begin to prepare them for life in school by helping them to recognise their names, individual letters and numbers, initial word sounds and encouraging emergent writing skills, etc. We do lots of early numeracy activities, from counting the children and working out how many cups / plates we need to measuring and comparing and using all sorts of mathematical language in play. The children are constantly encouraged to think for themselves, with guidance from practitioners. They begin to take responsibility for small tasks, eg setting the tables and helping others to increase their independence, eg putting on their own shoes / coats unaided. We aim for the children to be confident in their own abilities so that school is merely a continuation of what they have experienced in our nursery environment. To this end, we have very close links with The Mosley School in Anslow, and also with other primary schools in the Stretton and Rolleston area. Even mealtimes and snack times are used as learning opportunities, from comparing full / empty cups to counting plates and children to ensure there are enough for everyone and simple problem-solving questions. Children are also given many opportunities to empower by choosing their favourite stories or activities and develop attention skills & persistence. For more information on any aspect of the above, see our notice boards or speak to our practitioners. For more information on the Early Years Foundation Stage, visit the Foundation Years website. All children are different and, to reflect this, age ranges have been overlapped in the Early Years Foundation Stage (EYFS) to create broad developmental phases. This emphasises that each child's progress is individual to them and that different children develop at different rates. The observations we do on the children are centred around them as individuals and used to plan activities to enable them to take their own 'next steps' along their developmental storyline. A child does not suddenly move from one phase to another, and they do not make progress in all areas at the same time. However, there are some important 'steps' for each child to take along their own developmental pathway. During this period, young children's physical development is very rapid and they gain increasing control of their muscles. They also develop skills in moving their hands, feet, limbs and head, quickly becoming mobile and able to handle and manipulate objects. They are learning from the moment of birth. Even before their first words they find out a lot about language by hearing people talking, and are especially interested when it involves themselves and their daily lives. Sensitive care giving, which responds to children's growing understanding and emotional needs, helps to build secure attachments to special people such as parents, family members or carers. Regular, though flexible, routines help young children to gain a sense of order in the world and to anticipate events. A wide variety of experience, which involves all the senses, encourages learning and an interest in the environment. As children become mobile new opportunities for exploration and exercise open up. A safe and interesting environment, with age-appropriate resources, helps children to develop curiosity, coordination and physical abilities. This is a time when children can start to learn the beginnings of self-control and how to relate to other people. In this period children can be encouraged to develop their social and mental skills by people to whom they have a positive attachment. Building on their communication skills, children now begin to develop a sense of self and are more able to express their needs and feelings. Alongside non-verbal communication children learn a few simple words for everyday things and people. With encouragement and plenty of interaction with carers, children's communication skills grow and their vocabulary expands very rapidly during this period. Children in this phase are usually full of energy and need careful support to use it well. Growing physical strengths and skills mean that children need active times for exercise, and quiet times for calmer activities. Playing with other children is an important new area for learning. This helps children to better understand other people's thoughts and feelings, and to learn how to cooperate with others. Exploration and simple self-help builds a sense of self-confidence. Children are also learning about boundaries and how to handle frustration. Play with toys that come apart and fit together encourages problem solving and simple planning. Pretend play helps children to learn about a range of possibilities. Adults are an important source of security and comfort. Children's fine motor skills continue to develop and they enjoy making marks, using a variety of materials, looking at picture books and listening to stories, important steps in literacy. Self-help and independence soon emerge if adults support and encourage children in areas such as eating, dressing and toileting. Praise for new achievements helps to build their self-esteem. In this phase, children's language is developing rapidly and many are beginning to put sentences together. Joining in conversations with children is an important way for children to learn new things and to begin to think about past, present and future. Developing physical skills mean that children can now usually walk, climb and run, and join in active play with other children. This is an important time for learning about dangers and safe limits. An increased interest in joint play such as make-believe, construction and games helps children to learn the important social skills of sharing and cooperating. Children also learn more about helping adults in everyday activities and finding a balance between independence and complying with the wishes of others. Children still need the comfort and security of special people. Close, warm relationships with carers form the basis for much learning, such as encouraging children to make healthy choices in food and exercise. At this stage children are becoming more aware of their place in a community. Literacy and numeracy can develop rapidly with the support of a wide range of interesting materials and activities. Children's language is now much more complex, as many become adept at using longer sentences. Conversations with adults become a more important source of information, guidance and reassurance. During this period children are now building a stronger sense of their own identity and their place in a wider world. Children are learning to recognise the importance of social rules and customs, to show understanding and tolerance of others, and to learn how to be more controlled in their own behaviour. Learning and playing in small groups helps to foster the development of social skills. Children now become better able to plan and undertake more challenging activities with a wider range of materials for making and doing. In this phase children learn effectively in shared activities with more able peers and adults. Literacy and problem solving, reasoning and numeracy skills continue to develop. Children's developing understanding of cause and effect is encouraged by the introduction of a wider variety of equipment, media and technologies. Ofsted (Office for Standards in Education) is a non-ministerial government department established in 1992 to ensure that childcare providers offer the highest standards of childcare possible. The inspectors visit nurseries with no notice, (as well as schools and childminders with notice) to examine the premises, its facilities and the childcare & education provided by staff. Little Monsters Day Nursery is registered by Ofsted to care for 60 children at any one time, of which no more than 18 must be under 2 years of age at any one time. We are not registered for overnight care. - ‘Teaching is good because all staff fully understand how to promote children's learning and have high expectations for their achievements. As a result, children's progress is rapid given their starting points and capabilities. - The staff provide a range of interesting and stimulating resources and activities in both the indoor and outdoor areas which support children's varying interests over time. - Engagement between parents and carers and the key persons are positive, which ensures that everyone is well-informed about children's individual development and progress over time. Partnerships with parents and other providers ensure a smooth and successful transition within the nursery and between the nursery, other settings and school. - Children's emotional well-being is effectively supported through warm, sensitive and loving care, thereby promoting children's ability to settle well in the environment. For more information about Ofsted's role and responsibilities, visit their website. All 3 and 4 year olds are entitled to part time, funded sessions through the Nursery Education Funding, provided by Staffordshire County Council and starting the term after your child's 3rd birthday. The grant is paid each term and covers up to a maximum of 15 hours per week during term time only. The sessions can be spread over several days, with a minimum of 2 hours and a maximum claim of 10 hours in any one day. The funding can also be split between 2 different settings ~ whether private or maintained. We are able to offer Think 2 funded places for those children who are eligible for up to 11 hours per week all year round. For more information, For more information, either contact us or the Staffordshire County Council’s Family Information Service directly (telephone 0845 650 9876) or visit their website. In addition to the Nursery Education Funding, Child Tax Credit may be available to families who are earning below a certain threshold. 9 out of 10 families are eligible for this tax credit and it is paid in addition to Child Benefit. There is also a higher payment available for families with at least 1 child under 1 year old (the baby element) and for families with children that have a disability. The Working Tax Credit provides extra help to those parents in lower paid work with dependent children, if they work at least 16 hours per week. The childcare element of the Working Tax Credit can pay up to 70% of the cost of registered childcare. For more information on tax credits, contact the tax credit helpline on 0845 300 3900 or visit their website. Since April 2005, parents have been able to save up to £2,000 per year by paying for childcare in vouchers which are provided by their employer. You can pay up to £55 per week in childcare vouchers, which gives a saving on tax and NI contributions. These savings can be per person, so that both parents can pay for their Little Monsters childcare with vouchers. In order to make this saving, your employer must pay part of your salary to you in childcare vouchers, which are redeemable against the cost of the childcare that you would normally pay for. This is known as a 'salary sacrifice' and the terms of your employer's scheme must be approved by the Inland Revenue. It is not as complicated as it seems! There are several companies who offer the voucher services, such as Busy Bees, Accor Services, All Save, Kids of Wilmslow, Kiddivouchers and You At Work, to name but a few. The schemes can be accessed by any employer, regardless of size and the employer also benefits by saving money on the NI contributions they would have to pay on your salary too. From April 2014 we are offering parents the opportunity to spread the funding over the full year. This means that, instead of claiming 15 hours per week over 38 weeks (term-time only), they can have 11 hours of funded education every week for 50 weeks of the year (excluding Xmas and bank holidays, when the nursery is closed). For more information, contact your employer directly.